Amazon’s drone delivery service may be missing in action but the company has not given up on its dream of robots delivering parcels. It is launching Amazon Scout, a service employing six squat six-wheeled delivery robots, across Snohomish County, Washington, just north of its Seattle HQ. “These devices were created by Amazon, are the size of a small cooler and roll along sidewalks at a walking pace,” the head of the Scout project, Sean Scott, wrote in a blogpost. “The devices will autonomously follow their delivery route but will initially be accompanied by an Amazon employee. In 2013 Amazon’s boss, Jeff Bezos, launched Amazon Prime Air and announced an intention to begin offering flying deliveries direct to the home within five years. Prime Air was widely dismissed as a publicity stunt, with commentators noting that it was announced the day before the biggest online shopping day the year, Cyber Monday. Sure enough, by the end of that five-year timeline the company had announced just one successful trial – with two customers in UK who had huge gardens, lived close to an Amazon depot and were happy to order items that weighed less than 2.6kg. In the meantime, a number of startups have pursued the less ambitious target of putting small autonomous vehicles on pavements to deliver small parcels and food orders. These projects have been controversial in their own right, accused of clogging pavements and privatising public space, as well as leading to a loss of income for delivery workers. But they have progressed nonetheless. Starship Technologies, one of the leading companies in the sector, launched its first commercial business in April 2018 and is currently running trials in Milton Keynes in the UK. A Starship spokesperson gave Amazon’s project a cold welcome, saying: “We created this space four years ago and have since seen many other companies join, Amazon being the latest.”. Earlier in 2017, Chinese e-commerce giant Chinese Alibaba tested drones to deliver ginger tea ordered from its Taobao e-commerce website, as it steps up efforts to compete with American rival Amazon. The Chinese internet group has teamed up with delivery company Shanghai YTO Express Logistics to launch a drone delivery trial in Beijing, Shanghai and Guangzhou on Wednesday, according to a blog post on Alibaba’s e-commerce news website Alizila. 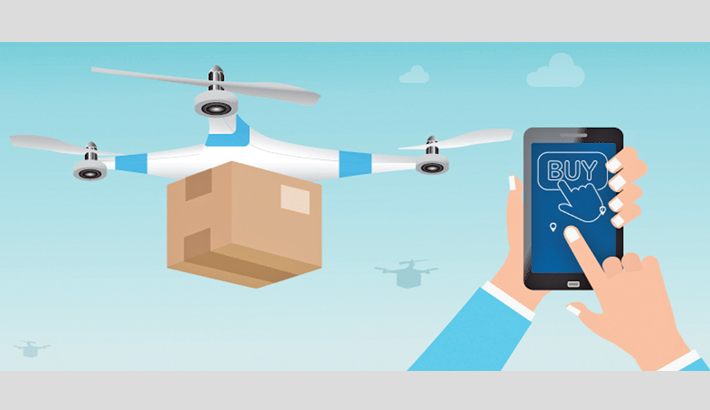 The move follows Amazon’s announcement in 2013 that it would be testing drones to deliver packages to customers in 30 minutes or less, although the program, dubbed “Prime Air,” has faced regulatory hurdles in the U.S.
Alibaba claims that its 49-renimbi ($7.84) ginger tea packets will be delivered within the hour. The drones won’t land directly on a consumer’s front door, but will instead land outside a residential buildings to be collected by human couriers who take over the final part of the delivery. It comes just days after a drone made by Chinese company DJI , underlining concerns about unmanned vehicles in civilian airspace.